How does the build look? How much testing is left? …I don’t know how to provide the simple answer they want. Well, my team has been using a successful little trick that is super easy to implement. We listed our modules on an old fashioned white board in an area that gets people traffic. Every three weeks, on build day, we run the smoke tests on the new build and if all tests for a given module pass, the module gets a little green smiley face drawn next to it. If any tests for a given module fail (to the extent said module is unaccepted), the module gets a sad red face. Finally, if any tests for a given module fail but we can work around the problems and accept the module, we draw a blue straight face. The white board slowly gets updated throughout the course of the day by me and my other QA colleagues as we complete smoke tests for each module. 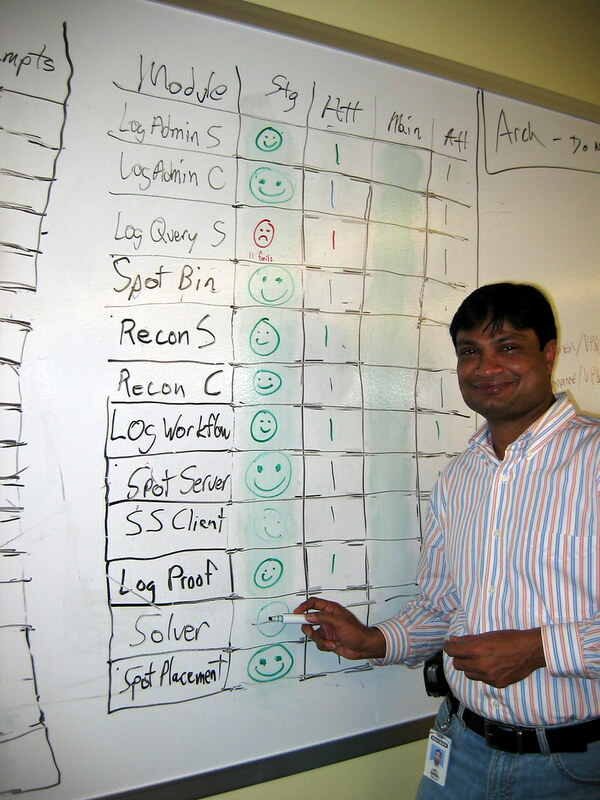 Satish looks happy in this picture because we were having a good build day. The various managers and dev leads naturally walk past the white board throughout the day and have instant knowledge of the state of the build. It shields QA from having to constantly answer questions. Instead, we hear fun remarks like “Looks like you finally got a big smiley on System Admin Server, Stephanie, that’s a relief!” or “What’s up with all the red sad faces on your server solutions, Rob? ”. Our build day white board was inspired by James Bach’s Low-Tech Dashboard, which contains some really cool ideas, some of which my team will experiment with soon. Michael Bolton introduced this to me in his excellent Rapid Software Testing class. Bach’s Low-Tech Dashboard is more complex but in exchange, it fends off even more inquisitive managers. If your company is obsessed with portals, gantt charts, spreadsheets, test case/defect reports, and e-mails, drawing smiley faces on a white board may be a refreshing alternative that will require less administrative work than its high-tech alternatives.